Preheat oven to 350°F. Lightly grease a 13x9 pan; set aside. In a large bowl combine the potatoes, sour cream, onion, cream soup, 1 ½ cups cheese, butter, salt and pepper. Mix well and taste for additional salt and pepper if necessary. Spread into prepared pan and bake uncovered at 350°F for 45 minutes. 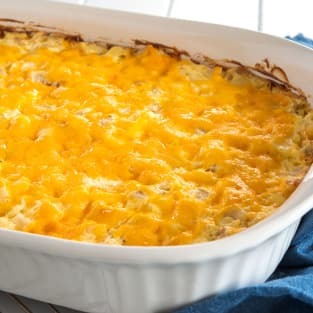 Remove from oven and top with remaining ½ cup of cheese. Bake for an additional 10 minutes, or until golden and bubbly.